What’s Your Nation Brand Index? Simon Anholt is the author of Another One Bites The Grass and Brand New Justice, two books that don’t get nearly the amount of attention they should. I’m glad to see Simon resurface recently in a partnership between him and research firm GMI. 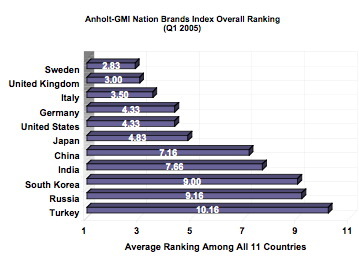 They have launched the Anholt-GMI Nation Brands Index. It’s probably next to impossible to find someone who doesn’t have a positive image of Sweden. But I was surprised to see the US score so high. The study acknowledges that only a limited number of countries were included in this first survey and that the US might not have scored so high if countries like France, Australia, New Zealand, and others were included. It will be interesting to follow this survey in future quarters. This index is free for download, for now at least, and well worth a read. Disney and China: How Local is Too Local?